Home MTAANI NEWS We are tired of “Kieleweke”, “Tanganga”, we want development - residents tell Kiambu leaders. We are tired of “Kieleweke”, “Tanganga”, we want development - residents tell Kiambu leaders. A section of the participants at Edgewood Country Club in Thika during Inooro’s Tv Kiririmbi live show on Sunday evening. A section of Kiambu residents have told off leaders going round the country preaching the politics of 2022 terming the endless politicking in the country as detrimental to development and President Uhuru Kenyatta’s Big 4 Agenda. 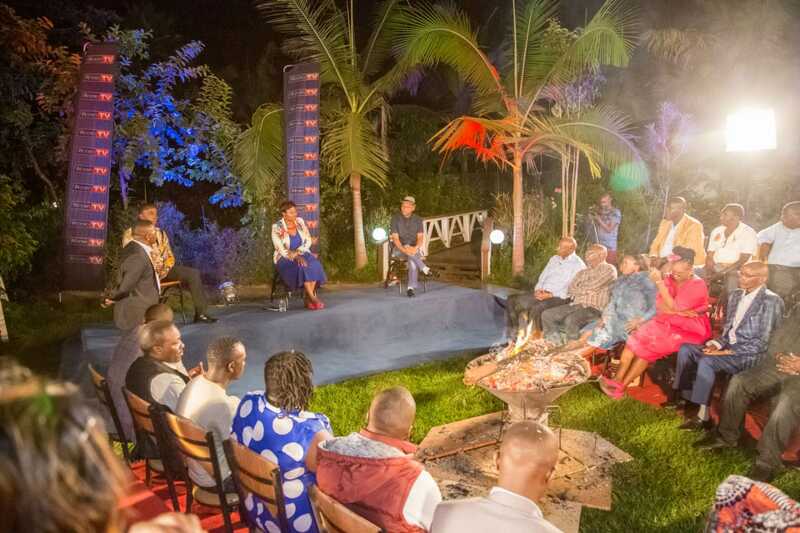 Speaking during a live show on Inooro’s Tv Kiririmbi at Edgewood Country Club in Thika, the residents, drawn from various parts of Kiambu Country said that the country was worse of now due to poor leadership by their local leaders. “We are tired of this ‘Kieleweke’ and ‘Tangatanga’ thing. What wananchi want from our leaders is service delivery and not this unending political tussles,” said one of the residents. The residents put to task the leaders present to explain what they were doing about various matters of concern especially on corruption, insecurity, education, unemployment and the poor state of the economy. Responding to their concerns, Thika Town MP Eng. Patrick Wainaina distanced himself from any of the warring factions within Jubilee Party saying he was only focused on the development agenda he promised the people of Thika. “Kenya is a very unique country where politics go on forever. If you look at the matters as they are now, majority of our leaders are very busy politicking about 2022 (General Elections) instead of initiating development programmes that are of benefit to the people who elected them,” he said. He challenged Kiambu County leaders to emulate Kitui and Makueni counties whose unity of purpose had attracted the national government attention to the benefit of the residents of the two devolved units. “Kiambu is very rich in resources. If only we as Kiambu leaders exhibited the kind of synergy demonstrated by Kitui and Makueni Counties, this region can make great strides in development. Otherwise, this politics of ego and bossing around will never take us anywhere,” said Wainaina. He urged people to register in large numbers for the National Integrated Identity Management system (NIIMS) or HUDUMA NAMBA as well as in the national census scheduled for August this year as this was the only way to guarantee themselves a proper government allocation of resources. His sentiments were echoed by his Gatundu South counterpart Moses Kuria who said that the politics of 2022 was draining the country at the expense of development. Kiambu Senator Kimani Wa Matangi called of Kiambu leaders to unite and ensure they took advantage of the existing resources to revive the collapsed industries in both manufacturing and agricultural sectors. He appealed to the leaders to work in synergy and put up a class in every national secondary school in the area to cater for local students who were disadvantaged when selections of Form One students was done. Kiambu Women Representative Gathoni Wamuchomba promised to follow up the matter of college students who got murdered by either their boyfriends or thugs noting that within a span of few years, the county had lost 9 students and yet none of these cases had come to a logical conclusion.